With Fathers’ Day behind us, Verizon has kicked off a new “Summer Sale” that includes everyone’s favorite stock Android device, the Galaxy Nexus. Originally priced at $299 before being permanently dropped to $199, Big Red’s first Nexus can now be had for $149 with an automatic $50 online discount. Not a bad price for what most of us would consider the best phone on America’s largest 4G LTE network. In related and semi-sad news, friends of ours from Best Buy are under the impression that the phone has been given the axe, at least in terms of replenishing stock. In some BBY inventory systems, the supply code has been changed to “X” for this phone, which is the standard “end of life” sign for their phones. 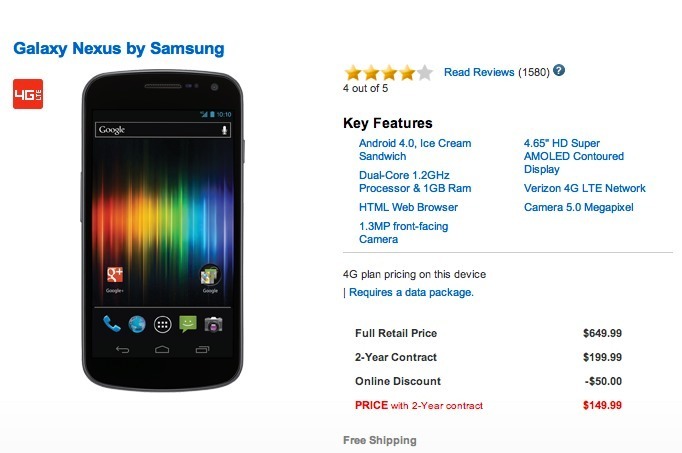 Without much of a marketing push and the Galaxy SIII almost upon us, maybe this is the right move.